Funds for Furry Friends started in 2001 when our founder, Shahna Rice took in a couple of Cocker Spaniels – Brooklyn and Armani. The pair found their way to Rice through another rescue organization she was volunteering with that was in overflow and did not have the space to take them. Rice took the dogs in on her own, vetted them and adopted them out to loving homes. This event marked the beginning of what has become one of the largest rescues in Manitoba. Over the next year, Rice received more requests to take in dogs. As the need grew, friends and co-workers began to offer their homes as temporary placement for the dogs, beginning a chain of foster families for the dogs being taken in. Financed and operated by Rice, the rescue took in around 39 dogs over the next year. Rice purchased crates and supplies for the foster families to use, and even gave up family vacations to cover the expenses of surgeries and extended vet care needed for some of the rescue dogs. Rice was diagnosed with breast cancer and despite undergoing treatments, the rescue’s operation continued. By 2003, the rescue had grown substantially. Another 56 dogs were placed in new homes, and the volunteer base continued to grow. In 2004, the rescue had grown to include a large base of volunteers. Still financed entirely by Rice, the rescue more than doubled the number of dogs, rescuing another 126 canines. The success of 2004 ended in tragedy, when Rice was diagnosed with terminal cancer near Christmas. The organization faced a possible end, just as it was on a spiral upwards. As fate would have it, the rescue did not shut down. Rice was joined by D’Arcy Barker, Cheryl Yeadon, Theresa vanHoof and Dana Grove – and a board of directors was formed. In 2005, the rescue moved from being operated and funded by a single person, and became a nationally registered charity operated by a board of directors. The rescue was able to save another 80 dogs over the 2005 year, and began it’s first year fundraising to maintain the rescue’s operation. ​In 2006 the rescue rolled forward, with a grand total of 206 dogs finding new homes through the rescue. This year marked the first “Fun Dog Day” - which would go on to become the rescue’s big annual fundraising event. Other fundraising efforts for the rescue began to emerge - many spearheaded by a couple of the rescue’s members at large - Teresa Truszynski and Christine Hearn. Over the next year, many members from the public stepped forth with donations of supplies, such as crates, pet food, treats, toys, collars and leashes… These things combined made it possible for the rescue to ultimately save more animals. The rescue changed hands in 2007, when Rice stepped down from her role as president for health reasons (but had remained actively involved in the rescue.) Grove stepped up as rescue president, and Theresa VanHoof joined the board of directors. By this time, the foster home base had expanded to include over 60 homes in Brandon and surrounding communities. Another 177 dogs found loving homes through the rescue this year. ​In 2008, we held our first annual "Caged for Critters" event, an event that placed upstanding members of the community in a cage to raise money for the rescue. To date a total of 196 dogs have moved into permanent homes with the help of Funds for Furry Friends and their volunteers. Year number 7 was a lucky one for many cats and dogs - but it was also a year of great sadness for the rescue. Our founder and friend, Shahna Rice, lost her battle with cancer on July 1st, 2008. This was a great loss to the rescue, and she will be greatly missed. SInce 2008 the rescue has continued to grow in volunteering, foster homes and animals saved and honouring Shahna's legacy to this day. 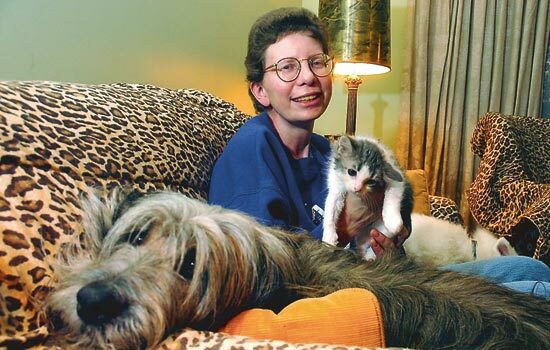 Because of her passion and commitment to animal rescue and welfare, Funds for Furry Friends has saved over 1200 animal lives in the Brandon and Westman area. The growing Board of Directors, Coordinators, Volunteers and Foster Homes continue to work hard to continue Shahna's legacy and vision of Funds for Furry Friends.